The iconic bike rack located outside of Linnaea’s Café hasn’t always been part of the Garden Street landscape. Strange to think, but there was a sad, lonely time when that jumble of handlebars, baskets, and humanity just didn’t exist. The original Linnaea’s Café Owner Linnaea Phillips had to fight for that hard-won rack many moons ago. 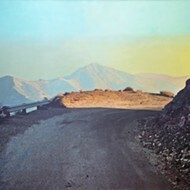 SHARE THE ROAD: Cynthia Meyer’s dreamy bicycle images are on display at Linnaea’s Café as part of JoyRride, an exhibit celebrating National Bike Month. Recently, when the bike rack was threatened again—this time due to the looming Garden Street Terraces Project—Orme carried on the tradition, rallying the troops to ensure that the rack would remain outside the eclectic community hangout. That famous hunk of metal—along with a slew of other bike-centric subjects—are featured in JoyRide, an exhibit held at Linnaea’s Café through May, National Bike Month. Nineteen local artists contributed to the show, and 25 percent of proceeds will go to the SLO Bike Coalition. Miss feeling the wind in your hair? This show proves that you’re only two wheels away from freedom. 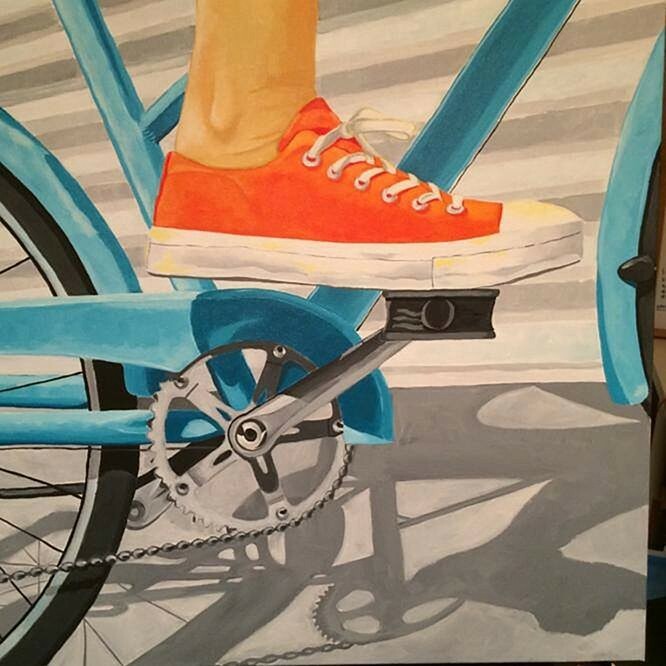 Amy McKay’s SLO Life painting is a cheery, breezy view of bright red sneakers pedaling with ease. The artist said she was inspired by Saturday morning cruises—especially the kind that end in delicious breakfast foods. Contributing artist Bret Brown is on a similar wavelength. 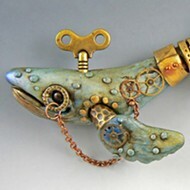 The artist is inspired by street art and the beauty of the natural world. When he’s not toiling over his artwork, you can find him mountain biking Cuesta Ridge. Now that the artist is older, Brown got to thinking about what friendship really means. Is it enough to hang out and ride bikes ’til the sun goes down? Or is your real buddy the one who will ride with you through the darkness in search of a lost Frisbee? “It got me thinking about the Hellen Keller quote, ‘Walking’—or in some cases riding—‘with a friend in the dark is better than walking alone in the light,’” Brown said. 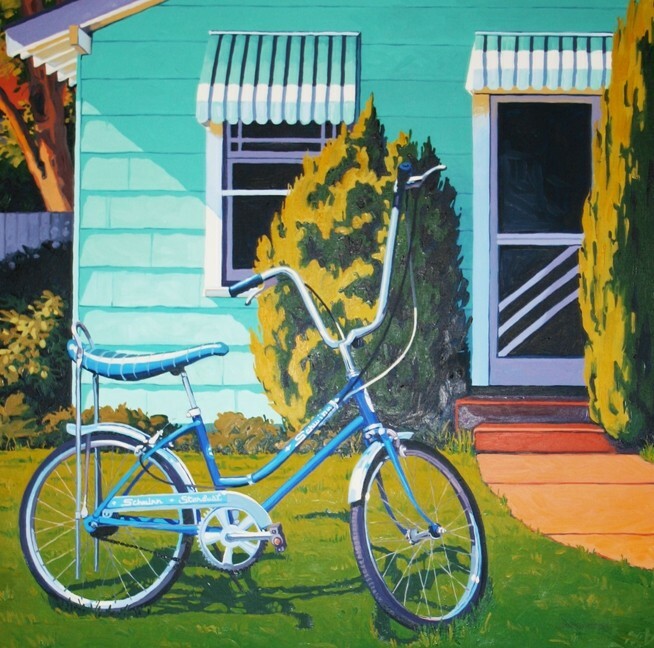 Artist Cynthia Meyer was inspired by her husband’s love of bike culture. Eric Meyer is a huge bike advocate in SLO, working on local bike paths and lending a hand at bike kitchens. 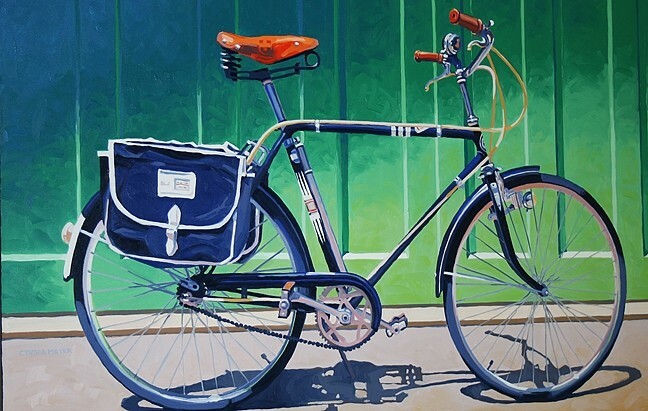 From 1940s clunkers to brand new retro reproductions, Meyer has painted a range of bicycles. You might even recognize the two bicycles featured in her artwork hanging at Linnaea’s. WHERE THE RUBBER HITS THE ROAD: JoyRide runs through May at Linnaea’s Café. Linnaea’s is located at 1110 Garden St. in SLO. 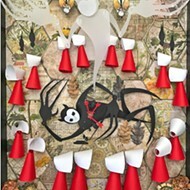 For further information about the art featured in JoyRide, contact Marianne Orme at linnaeascafeslo@gmail.com. With our incessant need to be connected via social media, “getting out and about” is no small feat. If you ask Brown, it’s downright crucial to the existence of our species. Sigh. Hayley Thomas is trying to coax her dog, Mavis, into her bicycle basket (again) at hthomas@newtimesslo.com.